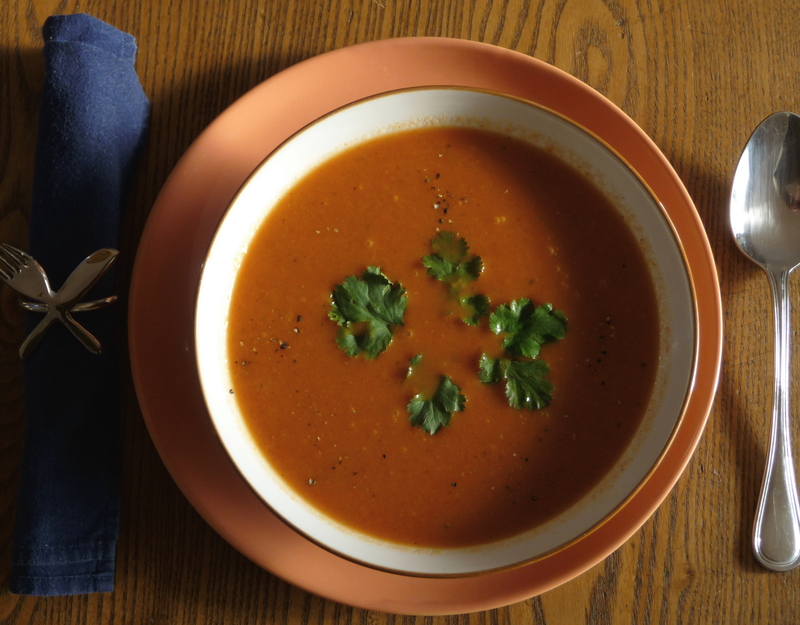 What happens when you combine down-home tomato soup with Indian spices? Spicy masala tomato soup is the inter-cultural result. Every winter around January, I seem to have a hankerin’ for traditional cream of tomato soup. I grew up with the canned Campbell’s variety. Sometimes I like to think I had a Warholesque-childhood, but, in truth, it was far more suburban and prosaic than that. I never really liked the thin tinny-tasting tinned soup. However, I later developed an appreciation for the home-made version. I had tried the “real” soup at dinner parties and home-cookin’ restaurants, where the tomato’s true identity shines through. A few years ago, I came across Martha Stewart’s recipe for tomato soup. Although I never use the cream option, this version makes a fine North American “cream” of tomato soup (NB: I would double the ingredients to make a larger portion, as a matter of course). It is the kind of tomato soup which would pair perfectly with a grilled cheese sandwich for lunch on a rainy or snowy day. The ingredients are generally in a well-stocked home pantry, so the soup can be ready in just over one-half hour. Looking for unique jewelry or gorgeous photography? Visit Kip’s Etsy site for her marvelous, distinctive handmade jewelry and stunning original photography. Some of Kip’s vibrant photographs are even food-related! In case you did not know, “masala” means mixture and often is a blend of spices, varying from place to place. It can also be a spicy tomato-base for curries (typical of the Punjab region, for instance). Kip’s particular blend from the Madras region worked well in a Sri Lankan dal I had made a week earlier. I wanted to make more use of the tantalizing spice blend. The soup combines the traditional American tomato base and texture with the masala, ginger, garlic, and cayenne, which enliven the flavours and add an unexpected dimension. An intriguing complexity of spices and some lively heat make it a nice surprise from the comfortable cream of tomato soup, but not so much that it is painful…or shocking. The soup has a good hearty consistency – not absolutely smooth. Its rich, burnt-orange colour looks warming and enticing on its own. Sometimes an unanticipated departure from a childhood favourite can be a good way to shake up your wintry routine. Heat oil in a large saucepan over medium-low heat. Add onion, cook, stirring occasionally, until onions have softened and are translucent, about 10 minutes. Add garlic, ginger, masala, and cayenne, stirring for two minutes. Add tomatoes, chicken stock, pepper; bring to a boil. Reduce heat to low and cook until tomatoes, onions, and garlic are soft, 10 to 15 minutes. If using a blender, working in batches, transfer soup to the jar of a blender and puree until smooth. 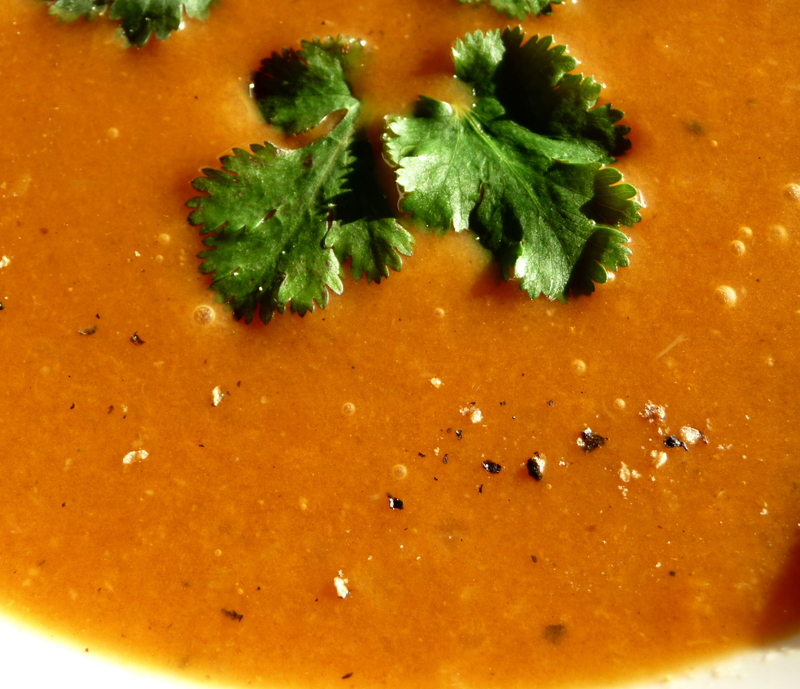 If using an immersion blender, puree the soup in the saucepan off the burner, until the desired consistency. If using a blender, return the soup to saucepan and place over medium heat and heat thoroughly. If soup seems too thick, stir in some extra stock or water to thin. Adjust seasonings – salt, pepper, and cayenne. This entry was posted in Main courses, Soups, Vegetarian and tagged Healthful, Indian, soup, tomatoes, vegetarian. Bookmark the permalink. That looks like a terrific soup, Dan! What a great idea to add the Indian spices. Thanks very much, Kath. It is easy and has enough for leftovers for two people – right up your alley! I love masala. It must be fabulous in a soup! I think tomato soup is often under rated. Yours looks and sounds outstanding. PS. I love your napkin ring. Hi, Mandy. I totally agree about tomato soup. It is an all-time classic! It’s really interesting that you talk about this as comfort food, too, because I’ve recently noticed that Indian-spiced food never fails to cheer me up. I definitely didn’t grow up eating chana masala, but I think the association of Indian food with comfort has to do with the warmth of the spices. Either way, you’re 100% right—this looks like comfort food at its best. Thanks, Maddie. I think the spices are invigorating and cheery in their complexity – and heat. Do let me know how the soup works for you. This seems like the perfect anecdote to a winter cold. Your close-up with the parsley is a gorgeous shot. Adding the masala is such an interesting idea and must give it such a nice added layer of flavor. Happy Tuesday! Hi, Geni. The soup would be good for a cold, so keep that in mind for the future – you could taste the spices through the worst head cold! To me there is something magical about tomato soup with Indian spices, it has such a nice heat and warms you up from the inside on cold days. Thanks, Louann. I think more people need to “discover” the magic of such spices in tomato soup. 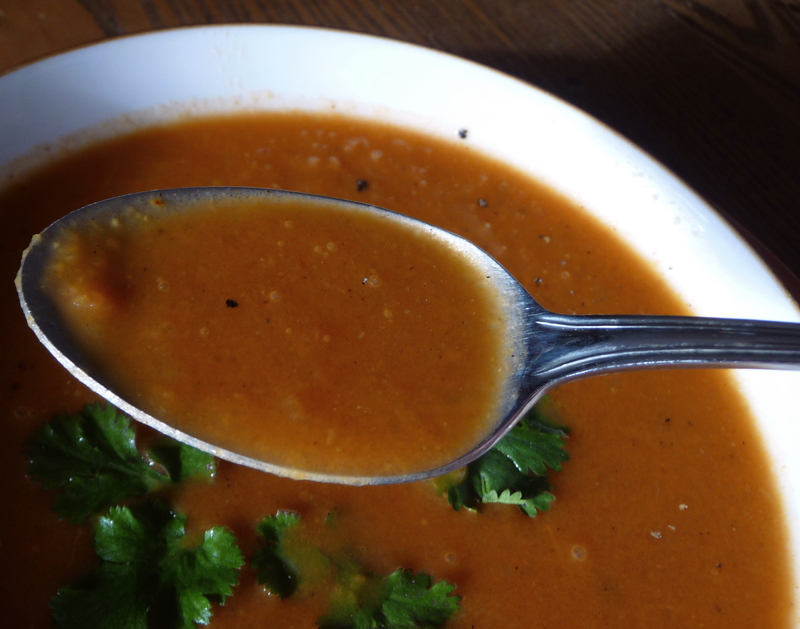 With all the gazpacho I consume during the summer, I don’t know why I didn’t ever think of cayenne – and other spices for an Indian twist – in the hot counterpart. Hi, Theresa. You’re right about our needing to get through the February doldrums here in the Gulf Islands – anything spicy or bright will help…. Thanks, Hanna. I think it’s a good way to warm up, even in the cold winters of Finland you face!